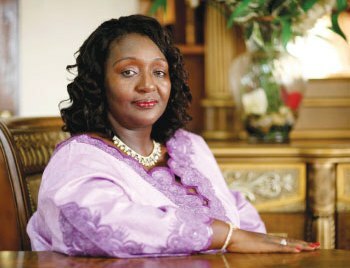 Madam Sia Nyama Koroma is First Lady of the Republic of Sierra Leone. With a solid background in the health sector as a Bio-Chemist, a post graduate degree in Synthetic Organic Chemistry – and at one point heading into Psychiatric Nursing, Madam Koroma sees it incumbent to support Government’s efforts in nation building and “a point of duty to complement Government in the health and education sectors”. With a desire to make an impact by engaging with all Sierra Leoneans, the Office of the First Lady has, in the last couple of years been working on women and children’s issues through a number of projects. For instance, the Women Initiative for Safer Health (WASH) is designed to “improve women’s reproductive health outcomes”. The objectives of the project include, but not limited to; increasing productive health knowledge among pregnant women; increase awareness of the dangers of pregnancy in communities; and increase use of the health facilities by communities. There is also the First Lady’s Attitudinal Change in School’s (FLAXIS) Project, which is designed to promote child education and examine the concept of attitudinal change in the overall behavior of young people in schools. It has over the years awarded scholarships to deserving students. Madam Koroma underscored the importance of “capacity building for our children” as she believes, the capacity of professionals like nurses must be built, whilst highlighting the need for more scholarship opportunities for the less privileged. (First lady talking to John Baimba Sesay). In essence, the First Lady has been extremely busy in supporting the country’s development project, particularly in the promotion of women and children’s issues. Sierra Leone has been attacked by an unexpected ‘enemy’ which continues to be a prevailing challenge, known as Ebola. The Chinese took a lead in providing supporting. The British and other development partners have also been on the ground helping. With such laudable initiatives the First Lady’s Office has been working on, and given the outbreak of the EVD, Madam Koroma told me, she is very much “concerned” about the effect of the virus on women and children. In Sierra Leone, women do take frontline roles, especially in the upkeep of homes. In most cases, especially in rural Sierra Leone, they serve as breadbasket of the family. Due to EVD, Madam Koroma believes, even “women master farmers could no longer farm”, thus affecting even the country’s farming season. At the regional level, Madam Koroma said, First Ladies have been working on First Ladies Initiative on Gender Dimension of Ebola Spread. This should help get a regional approach to integrate and harmonize countries’ approach to the virus, especially in tackling the post Ebola challenges. There are also plans for a Social Fund, to empower Ebola survivors, which is indicative of the commitment of First Ladies to see how Ebola survivors could be cared for. But “there is a lot to be done”, she acknowledged. Nurses and other health professionals have continued to make a national sacrifice, since a number of them have lost their lives to the EVD. Madam Koroma recognizes this reality, as she commends not just the Nurses but Doctors and other health works. “I empathize with especially nurses given the circumstance they are working on” She, however cautioned, they should do their best in taking infection control seriously, as well as try to “protect themselves”. Psychosocial counselling, she agreed, may play another important role, especially as health workers are now faced with stigma. And it is only when they are “in a good state of mind and be stable to work” that they will continue to give their best to the ongoing national fight. 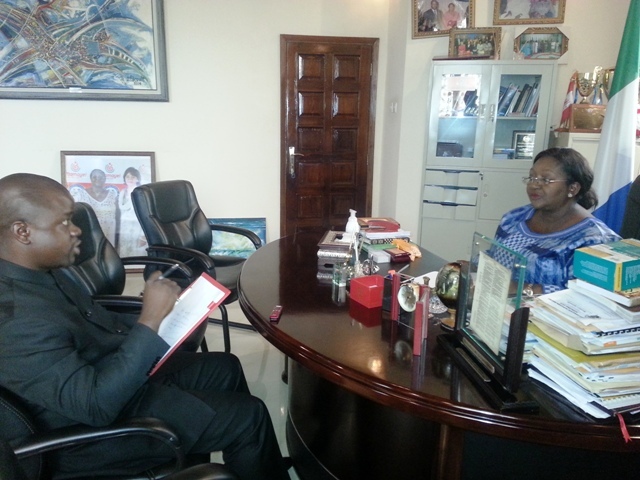 Madam Koroma said, Ebola is not the making of the countries now affected. Nations have closed their borders, and in some, citizens from Ebola affected nations are being stigmatized and victimized. Three airlines that used to fly in and out of Sierra Leone have placed an embargo on the country. I was left with a good impression about the First lady and her efforts towards national development over the years. She has not only been supportive of the president’s dream for a better Sierra Leone, she had taken the promotion of women and children’s issues as core of her daily routines. She, indeed, has added more value to what we have been doing as a country and which I would want to commend her. Thanks to all those who helped in facilitating this interview.